Helping kids learn to entertain themselves is a valuable lesson. When you just need a minute to yourself to make dinner or a phone call, having an activity for the kiddos to keep them quiet is priceless. I like having things that are portable to be put away when not in use or grab and go for a road trip. Because my time is limited, I’m always looking for super simple things I can make that won’t break the bank. Some of these ideas contain small pieces. Please, please, please be careful with these around young children. Felt is by far the cheapest and easy medium to use in your creations. Here’s a list of some of the things I’ve created but Pinterest has a million and one ideas. You can also just come up with your own things based on your child’s favorite things. Build a Rainbow – cut out “u” shaped pieces in the colors of the rainbow (red, orange, yellow, green, blue, purple), getting smaller in size with each color so they all stack on top of each other to make a rainbow when all stacked. Make a Pizza – cut a large circle out of a tan colored piece of felt to serve as the crust (or into triangular pieces if you want to make just a piece of pizza instead of the whole pizza). Red felt can serve as sauce, white felt as cheese, pink or red felt as pepperonis, brown for mushrooms, green for peppers. Your imagination is the limit on this one. Mr. Potato Head (or Mrs.) – cut a potato shape out of brown felt then cut the facial features out of other colored felt. Be creative! In addition to the basic eyes, nose and mouth, think about eye lashes, glasses, hats, ties or even freckles! Scenes – a little less mobile, you can glue a piece (or multiple pieces) of felt to an inexpensive baking sheet (check the dollar store) or a heavy piece of cardboard. Cut out things to decorate your scene – a home, barn, animals, cars, sun, moon, stars or whatever else you can come up with. These never get old! Even my older boys are still fascinated with magnets. Because these can be very harmful if swallowed, please be very careful when playing with them! With just one inexpensive baking sheet, you should have hours of fun just by switching out the magnets. Tic Tac Toe – use wipe board markers to draw out your board and some magnets (bought or homemade) to play. Connect Four – same concept as tic tac toe but with Connect Four rules. Matching – if you’ve got colored magnets, attach the paper to the baking sheet with the matching colored magnet. Magnet Sheets – you can buy sheets of magnetic paper that you could use similar to the felt scenes mentioned above (if you can’t draw, you can run the sheets through the printer and just cut them out). Good old fashioned crayons and paper are always a staple too. You can really do so much with them. Just a reminder (coming from someone who’s done it) to take the crayons inside with you. It doesn’t take long for one of those little guys to melt and flood your car seat only to create a lasting reminder. Consider keeping a clipboard on hand too. The hard surface will give you a nice hard place to write/color and the clip will help little hands hold on to their artwork. Coloring pages – rip them out of the coloring book or print off some with favorite characters. Activity sheets – there are lots of choices out there for books that could be purchased and many free ones that can be printed as well. Plain paper – let their imagines run wild! Prompts – on a blank piece of paper, write something for your child to continue to write about or illustrate. Examples would be “once upon a time,”, “When I woke up today,”, “Yesterday a lion escaped from the circus and then”, or “While I was playing my video game, I got sucked into the game then”. Lines – my boys love doing this. Draw a few lines on a piece of paper. They get to connect the lines somehow to make a picture. You can also turn this into a game by letting each person draw a line to complete the picture and see what you come up with. I like to be able to keep everything together so that these games are just “grab and go”. We keep ours in gallon sized zip top bags but you could also use diaper wipe containers. To keep all the bags together, I keep them all in a small tote bag that we can bring in the house to replenish but doesn’t take up too much room in the car. 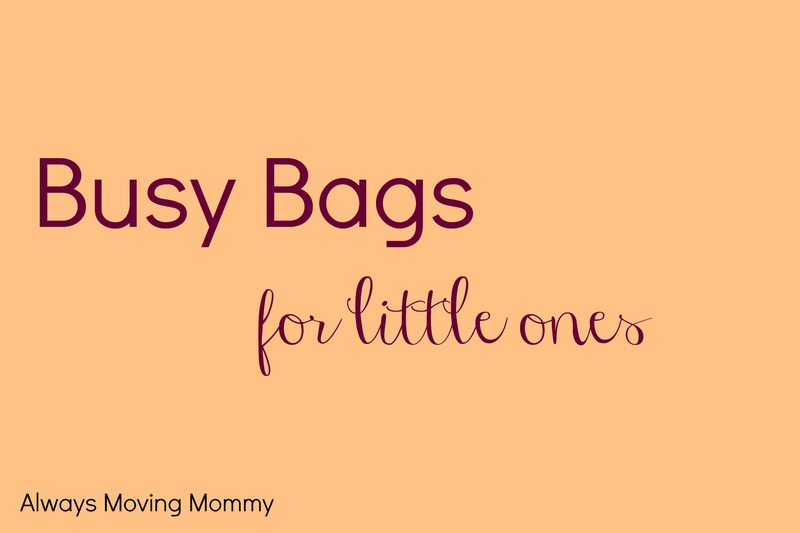 What kinds of busy bags and travel games do you like to make and play?